Today at the E3 conference in Los Angeles AMD officially reintroduced the FX brand for their top performing processors aimed at PC enthusiasts and gaming aficionados. As expected, the company also announced the first AM3+ platform based around the FX name. Dubbed Scorpius, the platform consists of AMD 9-series chipset motherboards, unlocked FX processors (codenamed Zambezi) powered by the Bulldozer core and Radeon HD 6000 Series of graphics cards. "AMD's FX brand will enable an over-the-top experience for PC enthusiasts," said Leslie Sobon, vice president of Worldwide Product Marketing, AMD. 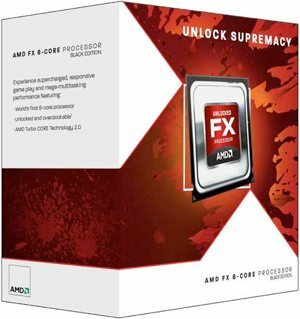 "By combining an unlocked, native eight-core processor, the latest in chipset technology, and AMD's latest graphics cards, FX customers will enjoy an unrivalled feature set and amazing control over their PC's performance." No actual products were launched, though AMD 9-series chipset motherboards from a handful of vendors are already available at online retailers. According to the latest leaked roadmaps, the company should start selling its mainstream A-Series processors on notebooks by the end of June and follow up with the FX-Series sometime between July and September. Pricing for AMD's enthusiast-grade chips is rumored to begin at $220 for the quad-core FX-4110, $240 for the six-core FX-6110, and $290 or $320 for the eight-core FX-8130 or FX-8130P, respectively. These are meant to compete with Intel's Core i5 2500K/2500 and Core i7 2600K/2600 processors on the upper end. Besides making the FX and Scorpius names official, AMD is also furthering its efforts to promote an advanced experience for gamers with the announcement that Bioware, Creative Assembly, Codemasters and Eidos have all joined the "Gaming Evolved" initiative. The latter is meant to ensure that games from these companies take full advantage of things like DirectX 11, Eyefinity multiple-monitor configurations, CrossFireX, and AMD HD3D support for 3D gaming.